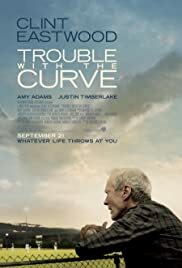 BEFORE: Advanced screenings continue with Trouble with the Curve, Clint Eastwood’s first acting job since Gran Torino in 2008. I watched six Eastwood films over the summer and I had mixed feelings. I was a fan of his directing/acting work, but the films where he just acted I didn’t like as much. I’ll be interested to see if this still holds true, or if this will be the first acting-only Eastwood film I find extraordinary. AFTER: Seeing a movie in a theater is a special experience. That’s why whenever I see a film in theaters I write a paragraph about it. Today’s note will be about one of the downsides to the theater experience; people who DON’T TURN OFF THEIR PHONES! Right at the beginning of the third act, aka the emotional turning point of a film, someone’s alarm went off and continued for a solid five minutes. Everyone, please, watch the Alamo Drafthouse PSA on texting in theaters and apply that to all phone use and conversations. But onto the actual film. It’s standard romantic comedy that you can predict from early on. That’s not to say it’s bad, but for films like these there needs to be something that differentiates it from every other romantic comedy to give you a reason to see it. The special part about this film is Clint Eastwood playing his grumpy old man character. While I don’t think anyone will ever be able to do that character as well as Eastwood, after you’ve seen it, it loses some of that magic. Eastwood by far got the biggest laughs for his crotchety remarks, but if you’ve seen Gran Torino or Blood Work, it starts to get a bit repetitive. It’s great to see Eastwood back on the screen, but I feel as if he’s doing better work behind the camera these days. Amy Adams on the other hand gave a great performance, the best of the film. Justin Timberlake was also quite surprising. I thought he did a great job in The Social Network and with a decent performance in Trouble with the Curve, I’ll be watching to see how well he does in the future. John Goodman and Bob Gunton (both last seen in Argo) also have minor supporting roles. If you’re looking for a great drama, or sports film, you won’t find it in Trouble with the Curve. You will find an OK film with some decent performances. And hopefully with no annoying people in the audience. Trouble with the Curve opens next week on September 21.